With the increase in electric mobility, public and private charge facilities will be required to provide solutions adjusted to the actual needs and requirements. A new methodology for dimensioning charge stations for electric vehicles (EVs) is presented in this paper. 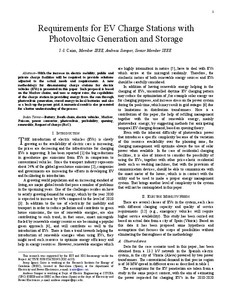 Such proposal is based on the Markov chains, and uses as output rates, the capabilities of the charge station in providing energy from the sun through photovoltaic generation, stored energy in local batteries and also as a back-up the power grid. A numerical result is also presented for a better understanding of the process. With the increase in electric mobility, public and private charge facilities will be required to provide solutions adjusted to the actual needs and requirements. A new methodology for dimensioning charge stations for electric vehicles (EVs) is presented in this paper. Such proposal is based on the Markov chains, and uses as output rates, the capabilities of the charge station in providing energy from the sun through photovoltaic generation, stored energy in local batteries and also as a back-up the power grid. A numerical result is also presented for a better understanding of the process. Cairó, I.; Sumper, A. Requirements for EV charge stations with photovoltaic generation and storage. A: IEEE Innovative Smart Grid Technologies Conference Europe. "ISGT - 2012 IEEE PES Innovative Smart Grid Technologies". 2012, p. 1-6.